CBD Cream Review: Does Lord Jones Work For Pain? We’re in the midst of a cannabis revolution in the beauty world. Weed may be best known for getting people high, but an increasing number of beauty brands are using it for entirely different reasons. In the last year or so, a slew of products infused with cannabidiol (CBD for short) has cropped up on the market, claiming to treat a host of concerns like acne and skin conditions like eczema. Unlike tetrahydrocannabinol (better known as THC), the chemical compound found in cannabis that leaves people feeling euphoric, CBD is nonpsychoactive, so it won’t get you high. That said, only the hemp-derived variety can be distributed nationally, according to the New York Times, so make sure to read labels thoroughly before purchasing anything made from it. While CBD can be found in virtually anything these days (even mascara), it’s most notably used in topical products such as CBD lotion and CBD cream because of its anti-inflammatory properties that are said to relieve body aches. As CBD explodes in popularity within the beauty industry, brands are selling more items laden with the powerful ingredient. Case in point: Lord Jones, a Los Angeles-based company that has gained a cult following for its offerings like CBD edibles like dark chocolate bars and gumdrops. At the time of this writing, they have a little over 44,000 followers on Instagram and counts celebrities such as Amy Schumer, Mandy Moore, and Sarah Paulson Stacy London as fans. 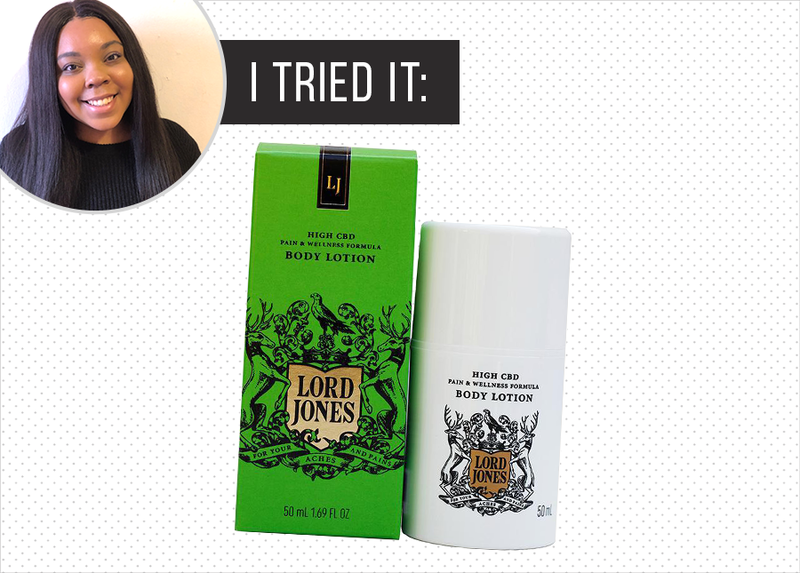 The Lord Jones High CBD Pain & Wellness Formula Body Lotion ($50), in particular, has been shared all over the internet for being a workhouse for relieving pain. In an interview back in January, Olivia Wilde told a reporter how much it helped to relieve her neck tightness during a six-month stint on Broadway. Given how powerful it is said to be for reducing pain, I knew I had to try it for this column. I’ve been dealing with migraines since I was 17, and I’ve had some terrible neck pain for the past couple of months, so I wanted to see if all the hype was warranted. As any chronic pain sufferer will tell you, there’s no shortage of products out there claiming to rid you of your agony or, at the very least, minimize it. I’ve tried a lot of them, only to be disappointed by how ineffective they were. Although I manage just fine with the painkillers I’ve been prescribed by my doctor, it’s nice having other means of treating it without having to take a pill every time I have a flare up. Four more uses later, I discovered that was simply a placebo effect. I wanted it to work so badly that I tricked my brain into thinking it did, when it reality, my neck stiffness likely just wore off in time. The exercises I was doing in bed probably helped a bit, too. After that initial test run, every time I rubbed some of the lotion on aching parts of body in hopes of feeling of better didn’t provide results — I waited and waited, but the pain still remained, albeit slightly reduced. I did, however, enjoy the slight cooling sensation I felt after each application, but it never last longer than a couple of minutes. There’s an old adage that you can’t be everything to everyone. And in this case, the uber-popular Lord Jones CBD Lotion wasn’t for me. But that doesn’t mean it won’t work for you (after all, tons of A-listers love it) — just don’t get your hopes up before trying it.